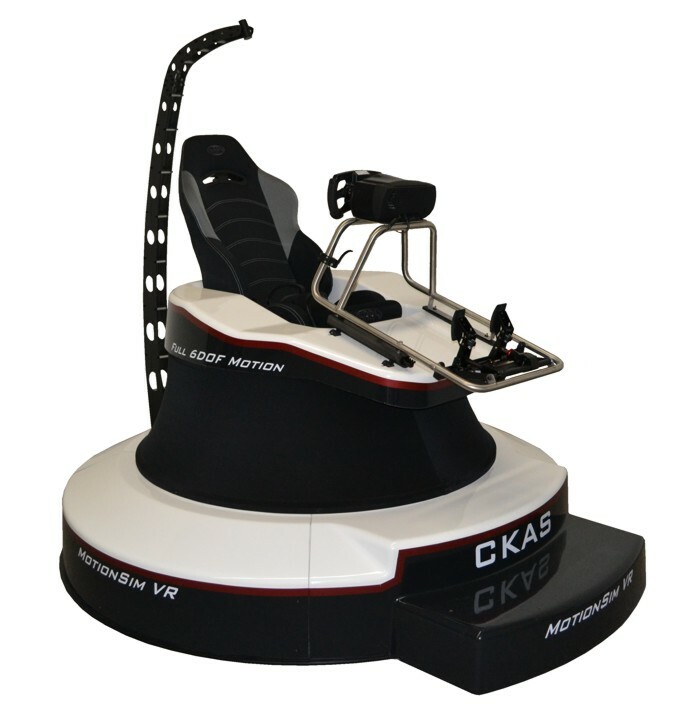 The CKAS MotionSim VR virtual reality simulators are some of the most exciting simulation devices on the market. These units have been developed as the next generation of entertainment simulators combining full 6DOF professional motion with leading edge virtual reality experience. The CKAS MotionSim VR simulators are an exciting and very affordable product available to all markets, including the serious home enthusiast. These units can be provided as racing simulators, flight simulators or as both with both sets of controls allowing them to be used in for theme parks, fun centres, racing teams or even for the exclusive home. With a unique ergonomically designed 6DOF configuration allowing safe and easy use, and an excellent industrial designed shell, the unit is a true show stopper. Combined with high force prosumer controls and a market leading next generation VR headset (newest model typically used) - this is one of the most realistic simulators which can be experienced. See also the CKAS VRSim Jetpack simulators (similar form factor). For more answers and information please read our Technical Section and FAQ, or alternatively, contact us with your query.